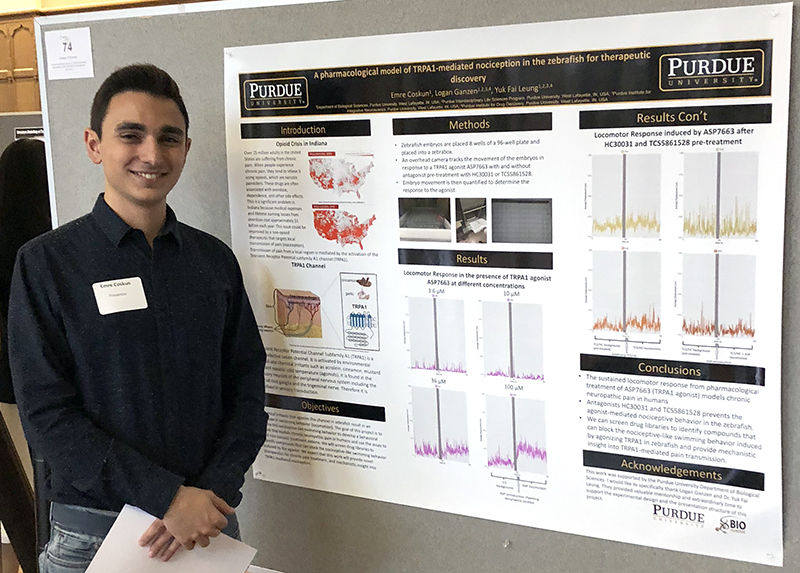 On 11/12/2018, Emre Coskun attended the Purdue Fall Undergraduate Research Exposition and presented a poster of his undergraduate reserarch work on “A Pharmacological Model of TRPA1-Mediated Nociception in the Zebrafish for Therapeutic Discovery”. This project was conceived by our graduate student Logan Ganzen. Logan and Emre worked closely to develop the foundation of this research project, and established zebrafish as a model for screening drugs to alleviate pain in patients. Emre presenting his undergraduate research work. This entry was posted by Yuk Fai Leung on November 17, 2018 at 1:59 PM under Fai's sharing, lab activities, lab research. You can leave a response, or trackback from your own site. Follow any responses to this entry through the RSS 2.0 feed.